If an evidence is in the form of a PST file, then viewing it may become complex due to the unavailability of a right application to access it i.e. MS Outlook. Artifacts can be of any kind thus it is required that the solution should be intelligent enough to help Forensicators examine even the smallest of the information from the emails of MS Outlook PST file. While investigating a device or any machine; the Forensicators are not allowed to make any kind of installation or uninstallation on that particular machine. Keeping all these in mind, one of the most primed and the finest tool that we can recommend is PST file opener. The MS Outlook PST file opener is an effective tool available for the users to open, read, & examine email messages, contacts, notes, calendars, drafts, of an MS Outlook PST file. Unlike any other file examination tool, it does not require MS Outlook environment in support to generate the preview of a PST file. In addition to that, it is available absolutely free of cost. Why Choose Outlook PST File Opener? 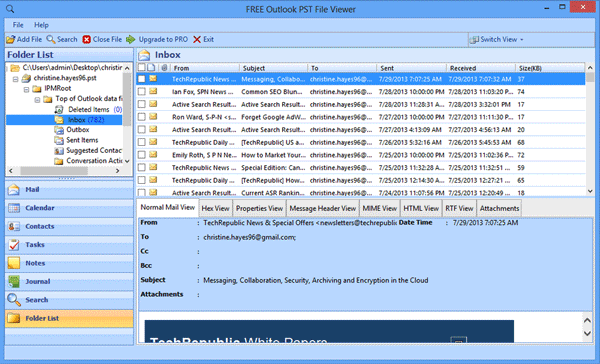 Even if MS Outlook is not present on the computer, the software allows viewing MS Outlook PST files. It is possible for a Forensicator to examine MS Outlook emails, contacts, tasks, notes, journals along with the attachments in it. If the PST file is inaccessible or corrupt, then the PST File Viewer will scan the file and recover lost data thereby generating a preview of all the emails being scanned by the tool. Besides opening the PST files, this can be the best solution to examine an email header. It is possible to view the email body, properties, hexadecimal view, MIME view, the email hop view and the associated attachment. Evidence can be a single PST file or a batch of PST files; whatever be the number, it is possible to examine all of them at a time. Bulk mode scanning of the tool makes it simpler to scan and examine PST files in multiple numbers. It is possible for the users to read the emails and the folders in its original structure. It will be easier for an investigator to examine the folders in its original hierarchy. All in all this free tool to open PST files can be a savior for the investigators to open, view & examine an orphan PST file in the absence of any PST file compatible application. In order to make a more comprehensive investigation for legal authority or law enforcement agencies, the tool can be upgraded to its pro version. You can perform advanced searching within the emails with PST opener pro. This option helps you to perform in-depth analysis of emails and lets you search keywords within emails along with its attachment. The examined emails can be saved in PDF format to be securely shared without involving the risk of amendments.